Visit Caravan Guard at the Caravan, Camping and Motorhome Show for a chance to win £500! The countdown is on to the UK’s biggest start-of-season showcase – the Caravan, Camping and Motorhome Show 2016 at the NEC in Birmingham from February 23rd to the 28th, 2016. Caravan Guard advisers will be ready to answer any questions on stand 12-07 and visitors will get a chance to win £500 in our Crack the Safe competition. All you have to do is drop by on any show day and try to unlock the safe by entering your own unique three digit code. 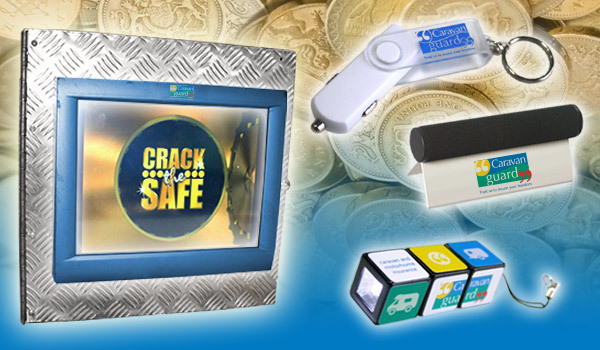 We’ll tweet any winners using #crackthesafe and update the Caravan Guard Facebook page. We also have some great new prizes on offer too, if you don’t manage to crack the code. Our clever electronic safe randomly allocates these runners up prizes. Visitors to the show can enjoy exclusive show offers, browse the latest models from some of the biggest caravan and motorhome brands, and check out 1,000s of holiday accessories. There’ll also be plenty of holiday inspiration from campsites and holiday parks, as well as cookery demonstrations, live dog displays, a Glamping Village and expert advice on taking pets on holiday. Looking for great insurance cover for your caravan and motorhome…? If you’re on the lookout for great value, 5 star Defaqto rated caravan insurance, or want great cover for your motorhome, we’ll be offering a fantastic 20% discount* on new tourer policies and £10 off brand new motorhome insurance policies throughout the show*. You can also come and find out about some of our safety and security discounts for the careful caravanner. And for that extra peace of mind why not come and talk to us about our Emergency cover, which pays for urgent repairs when the unthinkable happens at your home, or in your caravan or motorhome. Our advisers will be able to tell you more about the benefits of this additional product, exclusive to existing Caravan Guard policyholders. We’ll be exhibiting at the show from Tuesday, February 23rd to Sunday, February 28th. Drop on by for a chance to win a big cash prize as well as making some great savings on your motorhome or caravan insurance. If no-one is able to guess the three-digit code correctly throughout the six day show, we’ll choose a winner for the £500 prize at random and announce who’s won by March 21st, 2015. *20% touring caravan insurance discount includes 10% new policy discount plus Caravan Guard’s ‘club’ discount. Club discount can only be claimed once per policy term. 20% off and £10 off are available on new policies only – offers are not available in conjunction with other offers and end 30/6/17. Minimum premiums apply.